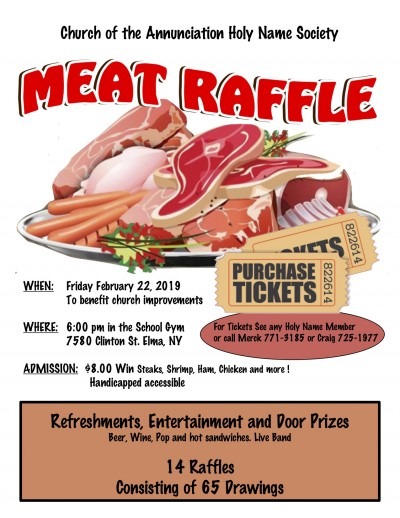 The Holy Name Society of the Church of the Annunciation, 7580 Clinton St., Elma, will host a meat raffle at 6:00pm Friday, Feb. 22 in the school gym. The event will include 14 raffles consisting of 65 drawings for steak, shrimp, ham, chicken and more! There will also be refreshments (beer, wine, pop and hot sandwiches), a live band and door prizes. Admission tickets are just $8 and the gym is handicap accessible. Proceeds from the event will benefit church improvements. For tickets or more information, please see any Annunciation Holy Name member or call Merck at 771-3185 or Craig at 725-1977.